It is becoming increasingly important to ask about new content for and methods of teaching and learning for different areas of education. This is the result of far-reaching processes of social transformation that have been triggered by the omnipresence of digital media and have long since reached educational institutions. Academics in various fields who conduct research on media and technologies and the areas of education affected by them talk of digitization and mediatization (Dittler 2017; Krotz 2012). This refers to the technical transformation process, and also seeks to explain possible transformation processes in schools, universities and other educational institutions that also affect social behaviour. When people talk about digitization, they generally mean infrastructure, hardware and software, and the platform and service structures of the Internet. Digital technologies are becoming increasingly interconnected with our bodies and with everyday objects, which makes them less noticeable than the bulky desktop computers of the (recent) past. Think only of the Internet of things: watches, vacuum cleaners and refrigerators that allow – and require – Internet access. Schools, universities and other educational institutions that have so far been dominated by a culture of writing and books now face the challenges of digital education (KMK 2016; Schelhowe et al. 2010). Increasingly, questions arise concerning individual media skills, resources and organizational responsibilities. On a more specific level: what are the consequences of the digital turn for one’s own institution? And how should teachers respond to them? In many places, deficit analyses focusing solely on technology result in textbooks and their contents being digitized without any further ado. Analogue teaching methods are transferred into the digital domain, either wholly or in part (in some cases merely individual worksheets). In this context, digitization is seen simply as “toolification”; for example, classroom response systems that replace the need for the teacher to request oral participation are supposed to “motivate” pupils to learn. Groups complete their (homework) assignments using wikis, blogs and the like. For the past 20 years or so, learning management systems such as Moodle, ILIAS and Stud.IP having been helping to organize unlimited learning scenarios that are generally known by the buzzword blended learning. Everyday life has long ceased to be analogue. | Photo: © Colourbox These approaches in many cases neglect the social importance of and possibilities offered by the digital domain, however: after all, not only texts and pictures can easily be embedded into lessons – other formats such as audio, video, simulations etc. that also reflect the social context of the ongoing shift can, too. If teaching materials were created in the form of open educational resources (OER), reuse options beyond the grey areas of media rights could also be initiated from the outset. It would be wrong to conclude that digital media and technologies automatically solve all problems in teaching and result per se in “better“ learning conditions, however. After all, the use of digital media and technologies does nothing to change the style of teaching – be it cooperative, project-based or teacher-centred. Instead, the teaching approach is often based on technologies. Only growing communication/interaction between teachers and learners can support a more individual form of learning through targeted support. When talking about mediatization, therefore, there is an intentional focus not only on the technical innovation – but also on the way people behave in and with the media. In short, how does our media behaviour influence the way we live together? Let us remember how the invention of book printing gave a voice to the individual, and how society was transformed by the Enlightenment. When these events occurred, there was also considerable scepticism at first. The situation is similar when it comes to digital media and technologies today: the Internet has not only had a major impact on our access to information and knowledge; digital applications also help to shape the way in which we communicate. Services such as WhatsApp, Facebook and Instagram make communication shorter, more visual and in some cases more public. It is not only a question of what we do with digital applications, but also of what digital applications do with us. | Photo: © plainpicture/Blend Images/Hill Street Studios Educational institutions now face the challenge of taking technical and social developments into account when designing their educational offerings. It has no doubt become clear that simply implementing digitization does not result in any genuine change. In fact, it reproduces existing inequalities because the use of digital media and technologies is still dependent on age, gender and educational background. The logical next step would be to regard the promotion of comprehensive media literacies as an interdisciplinary and lifelong task for all actors and institutions rather than limiting it only to specialist subject lessons. This not only encompasses teaching and learning goals in a more narrow sense, but also normative goals related to the concept of Bildung. This is because the field is in fact far less transparent than popular concepts for technology-enhanced learning would have us believe. Media-based content should be constantly renewed and reflected upon in the classroom, as well as put to the test in action- and problem-oriented formats by the learners themselves. Media constitute lesson content in their own right – or certainly should – if their role in opinion-forming is to be investigated. Striking examples include the way commercial social media services function, or more recent phenomena such as fake news. How can it be ensured that learners are able to distinguish genuine from false information in future, and how can media be used and tested to this end? On the other hand, media will simply become a tool if all they do is help acknowledge informally acquired knowledge, for example with the aid of e-portfolios. The use of (digital) technologies in education will only really point the way forward when engagement in and with media spawns new (communicative) practices in the classroom, which in turn are made the subject of discussion. Media development plans that regulate this area in educational organizations tend merely to provide teachers and learners with a framework for action that outlines the organization’s attitude towards media and how it promotes engagement with media. Overall, the field of media and education is too fluid. What is more, the widespread distinction between digital and analogue has more of a braking effect than is often thought. It has long ceased to be the case that digital media are simply a fad in the familiar “analogue” world. Given that they are omnipresent, not only tools and infrastructure should be discussed, but also education in a digital society as a whole (cf. Kerres 2018). It is up to the actors concerned to consider this “hot topic”. They themselves dictate how they set their actions in the context of the external requirements that arise as a result of the digital turn. Consciously recalling the original concept of education can prove very helpful when it comes to answering the many open questions connected to digitization and mediatization – starting from the inside and working one’s way out – and then jointly reflecting on the internal and external elements of an educational organization (cf. Hechler/Pasternack 2017: 9f.). Dittler, Ullrich (2017): Ein kurzer historischer Rückblick auf die bisherigen drei Wellen des E-Learning. In: Dittler, Ullrich (Ed. ): E-Learning 4.0. 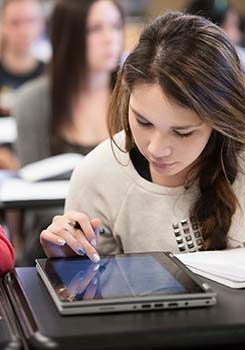 Mobile Learning, Lernen mit Smart Devices und Lernen in sozialen Netzwerken. Berlin: De Gruyter, p. 5-42. Hechler, Daniel/Pasternack, Peer (2017): Das elektronische Hochschulökosystem. In: hochschule, Edition 1, p. 7-18. Kerres, Michael (2018): Bildung in der digitalen Welt, wir haben die Wahl. In: Denk-doch-mal. Das online-Magazin. Krotz, Friedrich (2012): Von der Entdeckung der Zentralperspektive zur Augmented Reality: Wie Mediatisierung funktioniert. In: Krotz, Friedrich/Hepp, Andrea (Ed. ): Mediatisierte Welten: Forschungsfelder und Beschreibungsansätze. Wiesbaden: Springer VS, p. 27-55. KMK (Kultusministerkonferenz) (2016): Bildung in der digitalen Welt. Schelhowe, Heidi/Berg, Antje Vom/Grafe, Silke/Hagel, Heinz/Hasebrook, Joachim/Herzug, Bardo/Kiesel, Kurt/Koubek, Jochen/Niesyto, Horst/Reinmann, Gabi/ Schäfer, Markus (2010): Kompetenzen in der digital geprägten Kultur. Berlin: BMBF. Professor Sandra Hofhues is a professor of media didactics/media education at the Department of Education and Social Sciences at the University of Cologne’s Faculty of Human Sciences. Together with colleagues in the BMBF-funded “You(r) Study” joint project, she is currently researching how students use digital media for their academic studies in their own particular ways.